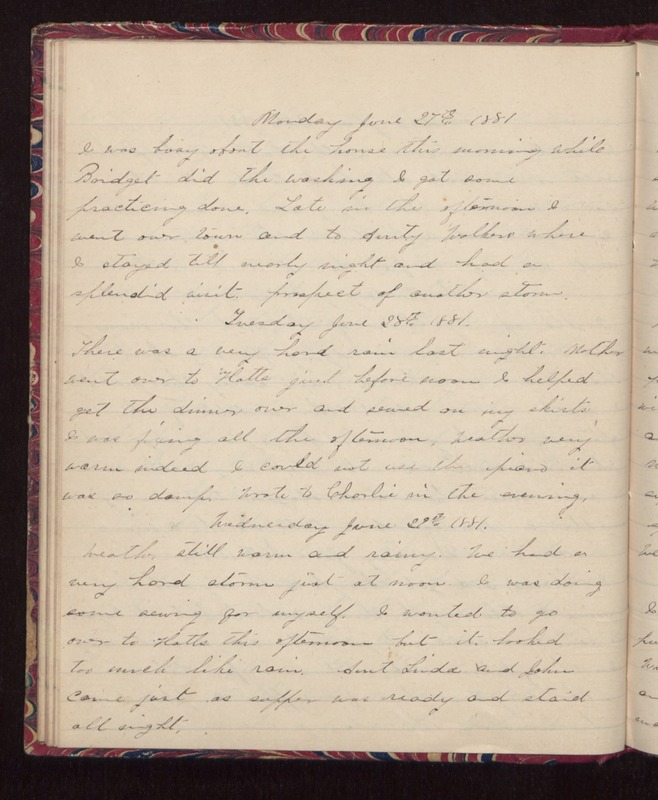 Monday June 27th 1881 I was busy about the house this morning while Bridget did the washing. I got some practicing done. Late in the afternoon I went over town and to Aunty Walkers where I stayed till nearly night and had a splendid visit. prospect of another storm. Tuesday June 28th 1881. There was a very hard rain last night. Mother went over to Hatts jist before noon. I helped get the dinner over and sewed on my skirts I was fixing all the afternoon. Weather very warm indeed. I could not use the piano it was so damp. Wrote to Charlie in the evening. Wednesday June 29th 1881. Weather still warm and rainy. We had a very hard storm just at noon. I was doing some sewing for myself. I wanted to go over to Hatts this afternoon but it looked too much like rain. Aunt Linda and John came just as supper was ready and staid all night.